It was a series of highs and lows this week in Cleveland. The Mariners ultimately left town with a 2-1 record this week, but not without some changes to the team. Nelson Cruz was pulled halfway through the game on Tuesday, due to back spasms. He noticed it during batting practice on Tuesday, a bit of tightness. After his at-bat in the 5th inning, M’s Skipper Lloyd McClendon pulled him immediately. His condition is listed as day-to-day, and the Mariners are taking it slow on the slugger’s return. Tuesday, we saw the continued use of Carson Smith in the 9th inning. 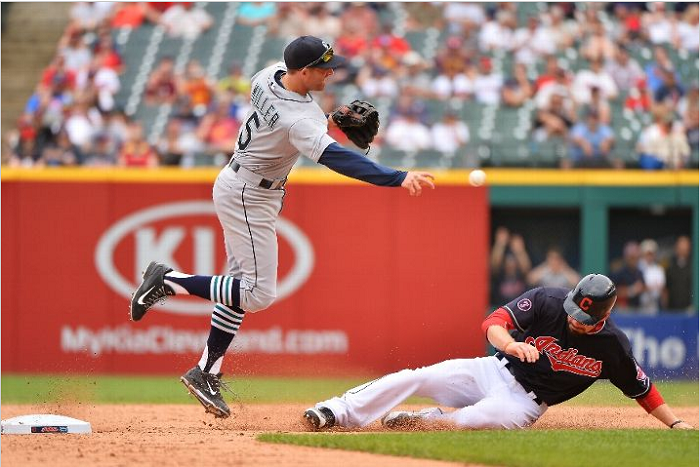 He didn’t escape the outing completely cleanly, he allowed a home run to the Indian’s Yan Gomes. However, after letting up another single, he settled down and ended the rally, earning his 2nd save. It was a great show of maturity, not losing his composure in the 9th, and bodes well for his future. With the demotion of Fernando Rodney to a lower pressure role in the bullpen, the M’s bullpen will hopefully, become a lot more reliable, in the future. It will give him a chance to work on some mechanical issues and maybe even come back stronger. Another bright spot this series was the young pitching. Quality starts by both Elias and Walker, along with a very solid 3 innings provided Wednesday, by newly acquired Vidal Nuno, show where the team’s true strength lies. JA Happ delivered his first poor outing since April on Thursday, but his track record shows this was the outlier start, not the trend. Newly acquired “slugger” Mark Trumbo had an exceptionally quiet series, going 0-12 with 1 RBI. He was tried out in right field on Wednesday, but as expected, didn’t impress. His main role should be established at the DH position, as he’s more of a defensive liability than Nelson Cruz in RF. With the failure of Trumbo to spark the offense, and the injury to Cruz, the direction of this team remains unclear. However, it should be noted that in an extremely balanced AL this season (even though the Mariners possess the 2nd worst record in the AL) they are not eliminated yet. There is still time to right the ship, and if they keep winning series like this one, that will go a long way towards helping out. Kyle Seager – With the rest of the offense seemingly taking a lot of time off recently, Kyle’s bat has remained steady, along with a Grand Slam on Wednesday. He batted 4-9 with 1 HR and 2 BB’s this series. The Mariners head to Houston to take on the suddenly-mortal Astros for a 3-game series beginning Friday night. King Felix takes the mound, to face uber-prospect Carlos Correa’s MLB debut. Finally, Morrison and Cano decide to contribute! !